The New Straits Times is an English-language newspaper published in Malaysia. 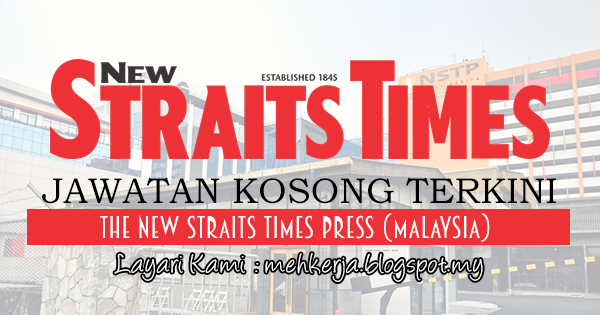 It is Malaysia's oldest newspaper still in print (though not the first), having been founded as The Straits Times in 1845, and was reestablished as the "New Straits Times" in 1974. The paper served as Malaysia's only broadsheet format English language newspaper. However, following the example of British newspapers The Times and The Independent, a tabloid version first rolled off the presses on 1 September 2004 and since 18 April 2005, the newspaper is published only in tabloid size, ending a 160-year-old tradition of broadsheet publication. The New Straits Times currently retails at RM1.50 (~37 USD cents) in Peninsular Malaysia and RM2.00 (~50 USD cents) in East Malaysia as on July 2016. 0 Response to " Jawatan Kosong di The New Straits Times Press (Malaysia) Berhad - 21 May 2017 [Gaji : Upto RM12,000 + Training will be provided & etc] "